The Finn Harps team pictured before their match with Longford Town on Monday. Photo: Stephen Doherty. 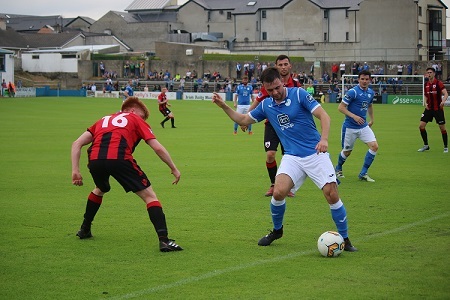 There was a Bank Holiday goals bonanza at Finn Park on Monday evening as Harps and Longford Town served up a cracking First Division encounter. In the end the visitors claimed all three points - and probably deservedly so. But Harps played their part in an entertaining contest that really could have gone either way. Harps were 2-0 down at half-time, but by the 56th minute, they had got themselves back level at 2-2 thanks to a Paddy McCourt penalty and a Mikey Place strike. Within a minute however, they were hit with a real sucker-punch when Longford regained the lead through Sam Verdon and Dylan McGlade sealed the points with a fourth late on. It was a busy Bank Holiday in the League of Ireland First Division with four games played. The Harps v Longford match had been postponed back at the beginning of March when the bad weather caused by the Beast from the East forced the cancellation of all games that weekend. Longford came to Ballybofey unbeaten in four and fresh from a notable 3-2 win at home to Galway United on Friday night. Aodh Dervin was on the mark in that victory and the 19-year-old Longford midfielder got his team off to the perfect start in this game. He latched onto Sam Verdon’s inviting knock-down to volley the ball in past Ciaran Gallagher from 12 yards. The goal came with less than four minutes gone and playing with confidence, Longford were the better side in those opening stages. Harps, with Mark Timlin (pictured) back in midfield after injury in place of Mark Coyle, really struggled to get into their stride. But once they did manage to string a few passes together, they looked like causing Longford a few problems coming forward. Mikey Place, was involved in the move which led to Harps’ first good chance, a shot from Ciaran O’Connor on 19 minutes which was saved by keeper Michael Kelly. Soon after Paddy McCourt and O’Connor combined to set up Jesse Devers but his goalbound effort deflected wide off a defender. With McCourt seeing a lot more of the ball, his influence on the game began to grow. But out of nothing, Longford pounced for a second on the half hour. Mark Timlin. But the home side conceded a poor goal on the half hour when Longford scored on the break following a Harps corner. Goalkeeper Kelly caught Timlin’s delivery and quickly bowled the ball out to Karl Chambers who raced up the field before releasing Dylan McGlade on goal. The Longford winger’s effort was half blocked by Ciaran Gallagher but there was enough pace on the ball to take it over the line. Longford should have been 3-0 up at the break but Verdon’s effort on 40 minutes came back off the inside of the post. Even before half time, Harps had chances with McCourt dragging a shot just wide and Devers having appeals for a penalty turned away when he went down under a heavy challenge inside the box. While that penalty claim was waved away, the referee Eoghan O’Shea ruled in their favour after another penalty shout shortly after the break. Devers was again the Harps player who went down and McCourt tucked away the penalty. Devers set up the Harps equaliser on 56 when a brilliant reverse pass released Place on goal and the teenage striker kept his nerve to find the bottom corner. But within a minute, Longford got themselves back in front when Harps were guilty of poor defending from a corner and when Dean Byrne returned the ball across goal, Verdon headed in. With the game delicately poised, Harps pushed for another equaliser. Instead it was Longford who struck again when McGlade scored his second of the match, racing clear and finishing past Gallagher. Harps to their credit, kept pressing for another and the brilliant McCourt set up substitute Niall McGinley in front of goal but his shot was saved. The game ended in a red card on the final whistle for Harps player Tommy McBride who was involved in an off the ball incident with an opponent. He will now miss his team's trip to Galway United on Friday night. Longford Town: Michael Kelly, Shane Elworthy (Jamie Hollywood 81), Tristan Hofmann, Dan O’Reilly, Mick McDonnell, Dean Zambra,Aodh Dervin, Karl Chambers, Dean Byrne (Chris Mulhall 87), Sam Verdon, Dylan McGlade.